A chatbot can be the personal assistant and marketing superstar of your dreams. Smart, responsive, independent, it lets you sell your brand and deliver superior customer service without supervision. WHAT IS SOCIAL CHATBOT MARKETING? Chatbots are an excellent tool for fielding enquiries and taking orders, but used really well, they can become part of your marketing funnel – building the relationship with your customer, even to establish your brand. The key to doing great business through social media is having a conversation with your customer. Your chatbot is the essential tool to make it happen. A chatbot is a semi-automated conversation flow in a chat window. On your website or in social media, it is a way for your customers to talk to your business one on one, explore their options, and interact in a way that is more personal than a website or FAQ page alone. Most human beings don’t want to research things or look them up: we just want to ask someone! A simple low-cost chatbot (the sort we can make*) uses response buttons to guide the customer through the conversation. A well-made chatbot is helpful, intuitive, likeable, even fun – so your business is well represented to your potential customers. We can create a chatbot that lives, breathes and speaks your business. Chatbots deal with enquiries, never missing a single one, with no complaints. Chatbots promote your brand, help your customers, sell your product. But always it is limited by the skill set of its creator. Few chatbots are created to perfection. At best, a chatbot that isn’t market-savvy and optimised for your customers can be underwhelming. At worst, it can result in a confused, dissatisfied, even angry customer. And that can mean a bad review or the dreaded one-star rating. That’s why your chatbot should be built by a team skilled in both development and conversational flow. 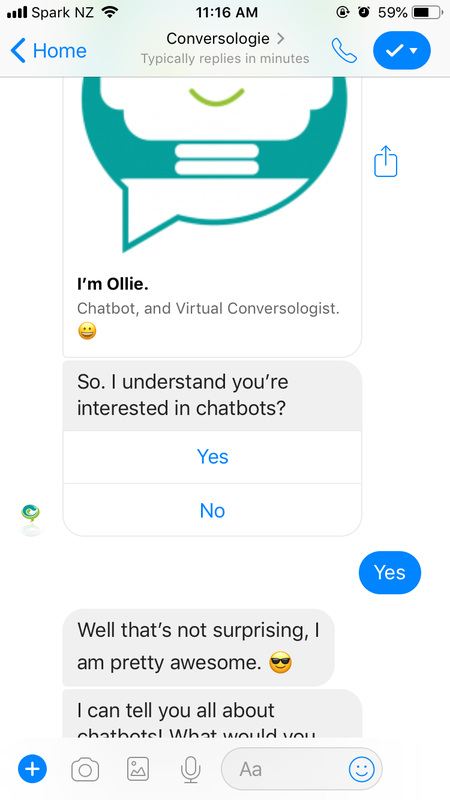 To get an idea of how a chatbot should work, you can try out our chatbot, Ollie, below. He’ll guide you through some basic info on chatbots, and you can even subscribe for daily tips and info about chatbots. Find out what Ollie has to say – and how he makes you feel. We would like to welcome everyone to our online classroom where we dive deep into the world of chatbots through a series of different topics. Featuring Chief Conversologist Jam Mayer and selected guests, we are proud to educate and engage with individuals who are looking to learn about the technology, social design, and integration of chatbots. Fill in the knowledge gap and join a webinar – it’s free anyway. At Conversologie, the more chatbots we build, the more we understand their potential. And we don’t just keep that knowledge to ourselves! We love sharing the building process with our clients. It helps us create a chatbot that is the best it can be, while we continue to refine our skills as social chatbot marketers. We even have partners in Artificial Intelligence for truly smart, cutting edge chatbots. AI chatbots don’t need buttons: they are designed to respond to normal written conversation and even learn better responses over time! An ambitious project with an agenda – literally – a chatbot that combined timed broadcasts to become virtual MC for a major event. The Social Media Conference NZ was our chance to combine interactive flows with to-the-minute timed broadcasts and some basic AI to create Jenda. From announcing speakers and rooms, giving directions to the bathroom, to gathering feedback, Jenda was a highly successful project. Fielding initial enquiries, answering common questions and taking bookings, and even offering reassurance, meet Helen. This clinic specialising in skin lesions and cancers successfully engaged a chatbot to take on customer enquiries, and even respond to the clicks on a Facebook Ads campaign, literally paying for herself in the process. A dogbot? We created a canine bot personality to lead users on a friendly walkies to book the event space. “The Entrepreneur’s Playground,” The Common is a shared space and business workshop and conference venue, characterised by two Schnauzers often on site. The dog personality worked well to create an engaging, fun chatbot, which fetched data and messages from users and sent it back to the team. This basic chatbot qualifies leads and answers queries. Our Christchurch NZ client wanted a simple chatbot that helped qualify leads and answer the most common easy-to-answer questions – to free her own time up for the important things. The language of this flow targets young people and their parents, introducing them to Career Matters’ service and process and helping them find a purchase option. In our partnership with enterprise developer Ako.AI, this bot required our input for cultural sensitivity. MyRivr helps people find services, everything from relationship counselling to budget advice. The chatbot’s name, personality, script, and even elements of technical flow (e.g. gender discovery needed to include 3+ categories) had to be adjusted. Consideration had to be given to the expectations and needs of minority and cultural groups. This is a complete browse-and-buy customer service chatbot. Based in Sydney, Australia, this was a more complicated chatbot designed to guide customers from the Facebook page through a browse and buy process. The bot will help customers choose their delicious purchase, take their order and even facilitate the online sale and delivery details. This very simple lead generating chatbot calculated the potential saving for businesses. An accounting business that combines overseas outsourcing with automation used a chatbot to let prospects discover their own potential savings. Supporting our partner and chatbot developer Ako.AI, our team fine-tuned the bot’s personality, simplified and clarified her language, and suggested additional chat flows and integrations to improve performance.